As we dart along our region’s man-made corridors in our automobiles, few of us realize that we are passing through a precious natural resource called the Western Greenway. Most of us have enjoyed at least one of the special lands within this greenway, and we take for granted that the open spaces we have enjoyed for years will always be there. However, with the hot real estate market of late, many of these parcels have been threatened with development. Ensuring that this green necklace will never be fragmented requires that several measures be taken to protect the parcels within the greenway. "Greenways are corridors of land and water and the natural, cultural and recreational resources they link together." (Creating Greenways: A Citizen’s Guide, by Jennifer A. Howard, Mass. DEM Greenway Program) They are comprised of open space, riverways, forests, farms, and historic structures. They can be simple as a foot trail connecting neighborhood parks, or as complex as an intricate network of trails and roads. Environmentally, greenways protect, conserve and link together natural resources and open areas. In doing these, greenways preserve environmentally sensitive areas and protect wildlife and their habitats. By connecting otherwise isolated habitats, they preserve biological diversity. Socially and culturally, greenways reconnect people with the land and with one another. They provide recreational opportunities close to home at little or no cost, and act as outdoor classrooms for children and adults. By protecting the areas that create a sense of place, the livability and character of our communities are enhanced. Greenways provide a positive way to shape growth and direct development away from sensitive areas. Economically, greenways increase property values by making our cities and towns desirable places to live. They minimize property damage from flooding. By adding to the recreational opportunities for visitors, they attract recreation and tourism based businesses, such as cross-country ski centers. Where is the Western Greenway? The Western Greenway is located almost entirely inside the triangle bounded on the northeast by Concord Avenue in Lexington and Belmont, on the southeast by the MBTA commuter rail and the now-abandoned Mass Central Rail line, and to the west by Lexington Street in Waltham. To be sure, there has been a significant amount of development inside this triangle. But there are also significant swaths of green space. The green space comprises various parcels, some of which are publicly-owned and have been designated as parks or conservation land. There are other publicly-owned parcels whose future is still undetermined, and there are some undeveloped parcels along the Greenway that are privately-owned. Some portions of the Greenway have well-established trails that are suitable for walking and hiking. Other portions of the Greenway contain dense vegetation, not to mention thorns, brambles, and poison ivy, making human use all but impossible at this time. 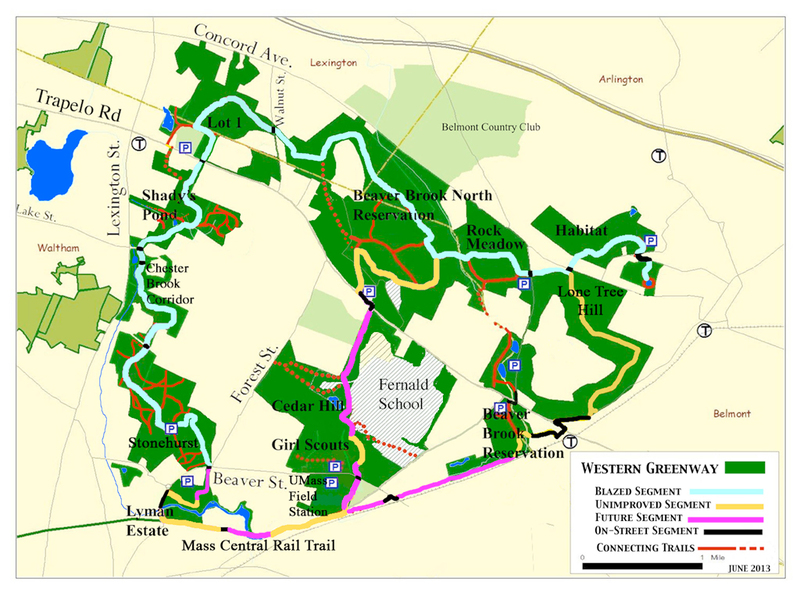 One long-term objective of the Waltham Land Trust, together with partner organizations like the Friends of the Western Greenway, is to construct a trail system throughout the entire Western Greenway. This will involve designing the most suitable locations for the trails, obtaining permissions and easements from the various landowners, and performing the work of actually clearing, marking, and maintaining the trails. The Greenway Map identifies the areas with existing trails, and shows the areas where new trails might be constructed in the future. Moving from east the west, the Greenway begins on Belmont Hill in Belmont, at the 87-acre Massachusetts Audubon Society Habitat Sanctuary. Habitat is a protected wildlife sanctuary with established walking trails. Just across Concord Avenue from Habitat is an 88 acre parcel of protected open space known as Lone Tree Hill. This land, formerly part of the McLlean Hospital, has well-used hiking and biking trails The area just across Concord Avenue from Habitat offers a good view of the greenway as far as Mackerel Hill in Waltham (currently the site of a large water tower). Just across Mill Street from Lone Tree Hill is Rock Meadow, which is also conservation land owned by the Town of Belmont. This meadow provides crucial habitat for many species that are rapidly disappearing as forests and development encroach on former farm land. Walking trails criss-cross the land, providing many opportunities for wildlife observation. At the western edge of Rock Meadow is Beaver Brook, a perennial stream that serves as the boundary between Belmont and Waltham. The New England Mountain Biking Association (NEMBA) has constructed a sturdy bridge over Beaver Brook, thus connecting trails in Belmont and Waltham. On the Waltham side of Beaver Brook is the 336 acre site of the former Metropolitan State Hospital. New apartments have been constructed in the footprint of the former hospital buildings. The remainder of the land is still open space. 254 acres have been designated as state parkland, under the jurisdiction of the Department of Conservation and Recreation (DCR). The DCR now calls this area, which occupies land in Lexington and Belmont as well as in Waltham, Beaver Brook North Reservation. In this reservation, several miles of old carriage roads loop through a variety of habitats: cattail marshes, red maple swamps, mature oak-hickory forests, vernal pools, new forests, and open meadows. Because of the diverse ecosystems, this area is a good place to observe a variety of wildlife, including species of special concern: wood frogs and painted turtles. On the west side of the apartment buildings, is West Meadow, a large "quaking" bog. During the summer and fall of 2009, volunteers constructed a trail and boardwalk across West Meadow. This trail connects Metropolitan Parkway North (the access road for the apartment complex) with Walnut Street in Lexingtion. Another 51 acres of the former Met State Hospital has been purchased by the city of Waltham. The original intent was to use this land to construct a nine-hole golf course, but those plans have not materialized. Due to deed restrictions, this land must be preserved as conservation land and it is thus a part of the Greenway. The city-owned property is the non-wooded section closest to Trapelo Road. The City of Waltham has also purchased the Gaebler building, which was once part of the Met State complex, along with seven acres of land that is primarily driveways and parking lots. A sign on the lawn near Trapelo Road identifies this property as Mackerel Hill Conservation Area. The building was demolished in late 2010. Opposite Woburn Street (in Waltham) and Walnut Street (in Lexington) is the site of the former Middlesex County Hospital. Of the original 110 acres occupied by the hospital, 44 acres have been used or are about to be used for housing developments (the Wellington Crossing development in Waltham and the Lexington Hills development in Lexington). Most of the remaining hospital land is still owned by the state. In 2008, the 47 acre parcel known as the Lexington portion of Lot 1 was transferred to the Department of Conservation and Recreation. Lot 1 abuts Walnut Street in Lexington, allowing it to become an extension of the Beaver Brook North reservation. Lot 1 also abuts other conservation lands in the town of Lexington that extend north to Concord Road. The smaller 6.4 acre Waltham portion of Lot 1 has been purchased by the City of Waltham. The city’s Falzone Field completes the connection between Lot 1 and Trapelo Road. The historic Wellington House is located on the Middlesex County Hospital property on Trapelo Road (just west of the fire station). Built in 1780 by William Wellington, whose ancestor settled in the area in 1630, the house is a fine example of Georgian architecture. The Wellington house is now owned by the City of Waltham and is being preserved using funds from the Community Preservation Act. Approximately six acres of land behind the Wellington House and the fire station is owned by the City of Waltham. This land abuts 9 acres of open space on the Wellington Crossing (Pulte Homes) property that has been set aside as open space according to the Waltham zoning requirements for that development. The Waltham portion of Lot 1 can also be accessed by walking a short distance on Bow Street, and entering the city-owned area of woods and wetlands. Bow Street continues on as an unpaved path which circumvents marshes and ends at the Wellington Crossing condo development. Lined with the ruined foundations of two colonial farms and an old stonewall, this road was once the original Trapelo Road. The area also contains a pond situated at the back of the Glen Meadow Apartments. The Lexington portion of Lot 1 (which is now Department of Conservation and Recreation land) contains several hiking trails. These can be accessed from the Lexington conservation land, from the Amyas Ames Nature Trail that is part of the Brookhaven property in Lexington or from Falzone Feild in Waltham. In the spring of 2011, a group of volunteers constructed a trail from Walnut street in Lexington to connect with the existing trail network in Lot 1. So there is now a good trail connection between the former Met State Hospital property and the former Middlesex County Hospital property. The portion of the Western Greenway that runs roughly parallel to Lexington Street is known as the Chester Brook Corridor. Chester Brook is a perennial stream which supported mills in several locations along its path in the past. Beginning at Hardy Pond, the brook runs along the west side of Lexington Street, is culverted at the Wal-Lex shopping center and emerges from the culvert on the east side of Lexington Street at Lake Street. Cattail marshes associated with the brook line the east side of Lexington Street in front of Bishop’s Forest Condominiums, the YMCA property the Kennedy Middle School. From there, it turns east and runs along Beaver Street, and merges with Beaver Brook near Linden Street, an area prone to severe flooding. Near the current location of the Northgate Apartments stood a grist mill built by Thomas Rider in 1680, and later Moses Mead’s 1790 mill (Waltham’s first industry) for manufacturing wooden farm tools. There were also mills and small ponds located at the Lyman estate. The northernmost section of the Chester Brook corridor is open space remaining from the former Middlesex County Hospital, plus the city-owned Falzone field, already described above. On the opposite side of Trapelo Road is Our Lady Comfortor of the Afflicted Catholic church. And just behind the church is a 26-acre, varied terrain of woods and wetlands. Once known as "Sam Stearns’ woodlot," this area was described in 1858 as having been wooded for many decades, and full of wildlife. An 1830 map of Waltham shows a substantial, wooded area in this region. Using the parcel as a woodlot, the Stearns family probably culled out trees, but never clear cut the woods, making these one of the oldest woods in Waltham. Middlesex County took the land by eminent domain in the 1930s, and eventually transferred the land to Our Lady’s parish. The city of Waltham purchased the property in 2005 and has named it Shady’s Pond Conservation Area. Connecting to the woods around Waltham’s Northeast Public School, the Shady’s Pond parcel contains a mature woods with a fern-covered floor, pine and oak covered ridges, a pond and cattail marsh, and a cascading stream that runs into Chester Brook. From the Shady’s Pond area, the Greenway corridor continues south, connecting with the approximately 7 acres of open space behind the Chesterbrook Apartments. This land is controlled by the Waltham Housing Authority, which has given its approval for a trail to cross its property. In the summer and fall of 2010, thanks to the efforts of numerous volunteers, a new trail has been constructed through the Shady’s Pond area as well as the Waltham Housing Authority property. The trail covers a varied terrain and includes four wooden bridges to cross streams and wetlands. The trail begins at Trapelo Road, just beside the sign for “Shady’s Pond Conservation Area” and continues to the boundary between the WHA land and the Bishop’s Forest Condominium property. A spur trail runs from the main Western Greenway trail, past Shady’s Pond itself, and into the parking area for the Chesterbrook apartments. Other spur trails lead from the Western Greenway trail into the property adjacent to the Northeast Elementary school. From the Waltham Housing Authority property, the Greenway corridor meets up with Chester Brook and follows the brook on property owned by the Bishop’s Forest Condominium associations and the YMCA. The YMCA property abuts 15 acres of woodlands owned by the Waltham School Department. In 2009, with the blessing of the Waltham School Board, land trust volunteers constructed a trail through these woods from the YMCA property boundary to the high school driveway. Both the YMCA and the two Bishops Forest condominium associations have granted permission for the Western Greenway trail to cross their land. Trail work on that short stretch took place in the summer of 2013, thus completing the trail through the entire Chester Brook Corridor. Just across the high school driveway is the landlocked Chesterbrook Woods, a 25-acre parcel which was acquired by the City of Waltham in 2001. A housing development was once planned for Chesterbrook Woods. With no way to access the site by road, the land has remained undisturbed. With wetlands draining into Chester Brook, the wooded property adds significantly to the size and value of the adjacent 108-acre Storer Conservation Lands, also known as the Robert Treat Paine estate. The Paine estate is owned by the City of Waltham and open to the public. There are numerous trails, some of them handicapped-accessible. The centerpiece of the property is the house designed by H.H. Richardson, with grounds planned by Frederick Law Olmstead. The grounds contain many mature specimen trees, as well as rhododendron and azaleas. The Storer Conservation Lands extend to Beaver Street and include the site of the first Waltham public meeting house, and Gentleman’s Way, the original Beaver Street. Just across Beaver Street from Robert Treat Paine Drive, the Western Greenway continues through the 37-acre Lyman Estate. The Lyman house was designed by Samuel McIntyre in 1793, and is owned by the Society for the Preservation of New England Antiquities. The estate includes the oldest greenhouse (dating to 1803) in the country and is open to the public. The 18th century English naturalist-style grounds with beautiful specimen trees and gardens are also open to the public. About 15 years ago, SPNEA considered selling the Lyman Estate, but eventually decided against this action. The Lyman house faces a body of water that looks like a pond but is in fact the continuation of Chester Brook, on its way to Linden Street and Main Street, where it will be culverted for its final journey to the Charles River. Just beyond Chester Brook is the now-abandoned Central Mass Rail corridor, which may some day become the Wayside Rail Trail. A second north-to-south corridor of the Greenway begins on the south side of Mackerel Hill (the hill in front of the old Gaebler unit, with the water tower on top), and crosses Trapelo Road to the Fernald Center. Running along the western border of the Fernald Center, adjacent to the Veterans Athletic Fields, is a strip of undeveloped land. The open space at the Fernald Center is crucial in linking the greenway to the Beaver Street properties. The Fernald Center is still in active use, but has been scheduled for closing, perhaps as soon as 2010. This property includes Owl Hill, a 250-foot elevation between Trapelo Road and Waverley Oaks Road. The hill is largely undeveloped on its north and south slopes, and is used for sledding by Waltham children. There are several streams running through the 180 acres of the Fernald Center, and they eventually flow into Lawrence Meadows. At the southwest corner of the Fernald Center is the City of Waltham's Forest Street Park, originally part of a larger parcel deeded to the city by the estate of Cornelia Warren. This 11-acre parcel is located along Forest Street between the Gann Academy and the Girl Scouts’ Cedar Hill Reservation. A stream draining from Mount Enoch (location of the Northeast Elementary School) crosses through the site, and connects with Clematis Brook. This wetland habitat is protected under state law, since a species of special concern, painted turtles, has been found here. Along the southern border of the Fernald Center are two more parcels that belonged to Cornelia Warren: the Patriot Trail Girl Scouts’ Cedar Hill Reservation and the University of Massachusetts’ Lawrence Meadows. Cedar Hill is fenced for the safety of the children camping there, but the reservation also acts as an animal corridor within the greenway. The Cedar Hill reservation includes Clematis Brook, a spring-fed pond, diverse plant and tree species, and the 1730 Isaac Mixer house. The 75-acre camp has offered generations of girls from around Boston an opportunity to observe and learn about wildlife, sit around the campfire toasting marshmallows, and camp out overnight in the woods. On the eastern side of Cedar Hill, at the intersection of Waverley Oaks Road and Beaver Street is a large marsh called Lawrence Meadows, named for Frederick Lawrence, the farmer who once owned it. Bequeathed to the University of Massachusetts by Cornelia Warren, this wetlands area performs an essential function in retaining flood waters. With streams from Cedar Hill and Owl Hill draining into it, the cattail marsh and bog provides a habitat for many species, such as red-winged blackbirds. Clematis Brook crosses under Waverley Oaks Road here and merges with Beaver Brook. Situated on the western side of the Girl Scout camp is another Cornelia Warren bequest, the 15-acre Waltham Woods. Owned by the City of Waltham, the peak of Cedar Hill here offers fine views to the south. Waltham science teachers have brought their classes here to observe the red-tail hawks nesting in the trees. Visitors can access the site through the Girl Scout reservation. On several occasions in the past, this site has been threatened with development by Bentley College and a privately operated hockey arena. Across Beaver Street from the Cedar Hill Reservation is Cornelia Warren Field, bequeathed to the City of Waltham and used as a softball field. Adjacent to Cornelia Warren Field is the University of Massachusetts Field Station. Until a few years ago, the Extension Service of the Agricultural School was located along Beaver Street. The farm land is still used by a variety of non-profit groups. 5 acres of the land are farmed by the Waltham Fields Community Farm, which grows organic vegetables for hunger relief organizations, and provides educational programs about farming to school groups. Several more acres are used by the Waltham Community Gardens, which rents land to Waltham residents for planting flowers and vegetables. This group offers a much-needed opportunity to garden for the large percentage of apartment dwellers in the city. The University of Massachusetts is reviewing the use of this site as part its overall master plan. If the state is serious about saving dwindling farmland in Massachusetts, it could begin by retaining this land in its current use. To the south, the UMass property abuts the abandoned railroad property that will be the site of the Wayside Rail Trail. The Rail Trail, when completed, will provide a connection to the previously-described Chester Brook corridor of the Western Greenway. A third north-south corridor of the Greenway follows Beaver Brook from the Beaver Brook North reservation and Rock Meadow to the historic Beaver Brook reservation that flanks Trapelo Road. The land between the reservations is privately owned by the abutters of Beaver Brook and is therefore not available to hikers. However, Beaver Brook is an important corridor for wildlife and it is important for the area to be preserved as wetlands. The final north-south corridor of the Greenway is the open space portion surrounding McLean Hospital in Belmont. This land includes the Lone Tree Hill conservation land, the Highland Meadow Cemetery and 27 acres owned by McLean Hospital, but protected with a conservation restriction. The land contains well developed trails actively used by walkers and mountain bikers. What can we do to protect the Western Greenway? Advocate for official recognition of the Western Greenway by our city councils and boards of selectmen, and by the Massachusetts Department of Environmental Management Greenways Program. A greenway is not a legal or zoning restriction, but rather a concept, and a planning tool. Getting the support of municipal governments and land owners is helpful in establishing the legitimacy of the greenway. Educate the various property owners or guardians about the significance of their parcel within the greenway. Since much of the land is owned by public or non-profit institutions, pointing out the value of the natural resources on their property, and the even greater value of a greenway may help deter adverse plans. Also, educate other state departments, such as the Executive Office of Energy and Environmental Affairs, who can influence the plans of state agencies such as the Dept. of Mental Retardation or the University of Massachusetts. Push for the preservation of open space when changes in the use of public land are proposed. Much of the property within the Western Greenway is publicly owned land and zoned for conservation. However, crucial greenway parcels can be lost unless the public remains interested and vocal about the value of public land as open space. For instance, on two occasions in the last two decades, the City of Waltham has seriously considered selling or leasing the Waltham Woods for development. Rather than tear down and reuse existing buildings at the Fernald Center, the state left the buildings vacant and rotting dangerously, and instead built new buildings that consumed open space and filled in wetlands. Over the last two decades, various undesirable plans were proposed for the Metropolitan State Hospital, including an MWRA sewage sludge dump and sludge processing plant, and a cemetery. Through the efforts of a Waltham city councilor, the Met State wetlands had previously been protected under a Massachusetts Natural Resources Act, which helped defeat these proposals. Heeding the public’s call for open space preservation, Waltham, Lexington and Belmont thwarted the Commonwealth’s original plans to develop a large portion of the Met State, when the land was declared surplus. These examples demonstrate that active citizen involvement in the planning process for publicly owned land is essential to protect the natural resources. Work toward obtaining added protection using zoning laws, open space plans, natural resources laws, and conservation easements and restrictions. On the local level, placing added conservation restrictions on publicly owned land will relieve pressure on public officials by developers who seek to purchase or lease public land and request the related zoning variances. On the state level, conservation restrictions will give state environmental agencies added leverage in dealing with other state agencies who want to develop state-owned lands. Working with private owners to point out tax advantages of conservation easements and restrictions may convince the owners to leave part or all of their land undeveloped. Support the efforts of municipal governments to purchase endangered open space parcels within the greenway. Many of us have enjoyed the benefits of the six-mile, green swath through Belmont, Lexington and Waltham, but we should not take its presence for granted. Even publicly owned land can be lost to development. An official greenway designation by the Massachusetts Department of Environmental Management would help protect the many ecologically valuable parcels within the Western Greenway. Although the designation does not confer legal protection on land within a greenway, the status would particularly help protect the large state-owned parcels. It would also aid in acquiring state funds for creating a trail system. Obtaining the official recognition requires the broad support of owners and citizens of Waltham, Belmont and Lexington. For more information, visit the Greenways and Trails page of the Department of Conservation and Recreation’s website and other sites listed in the links section of this website.